What Are The Different Kinds of Interior Shutters? Indoor shutters can be designed for different sizes and types of windows in your home. But not all interior shutters are equal. There are a few different types of shutter to to pick from, and options within those categories with regards to material, louver size, and more. Let's talk about the various choices available for indoor shutters, and how each one can benefit your space. Plantation shutters in Oklahoma City are the preferred type of shutters because they let in the light easily when open, block the most temperature when closed – and exude elegance either way. The wide louvers, or shutter slats, are one of the features that differentiate plantation shutters from other window treatments. The louvers range from 2.5” to 4.5” wide. These large slats result in more view from your window and bring more light into the home. Connecting the louvers together, the stiles are the firm vertical parts of the shutter panel, allowing for the movement of the louvers in unison. We provide four superior types of indoor plantation shutters that are custom made to fit your windows seamlessly: Polywood®, Ovation® wood, Reclaimed Wood, and Studio Shutters. Made from a premium synthetic wood substitute, Polywood shutters won’t crack, split, warp, or chip. The premium paint color on these indoor shutters won't fade or yellow when the sunlight touches them because of our exclusive paint that’s baked onto each shutter and infused with UV stabilizers. Ovation shutters are handmade from furniture-grade teak and come in a host of stains to complement your present wood trim and decor. Reclaimed Wood shutters are made from repurposed old wood that was originally part of barns, fences, and other structures. Every piece of wood is unique, and together they form not only a functional shutter, but a beautiful work of art on your windows. The newest addition to the Sunburst family, Studio Shutters are a builder-grade plantation shutter that conveys the same classic style as our Polywood shutters. With a few less add-ons than other plantation shutters, Studio shutters are a great choice for homeowners who don't want to break the bank with their window coverings. With smaller louvers and a traditional look, colonial shutters are an older option for Oklahoma City. The sizes for colonial louvers commonly range from 0.75” to 1.25”. 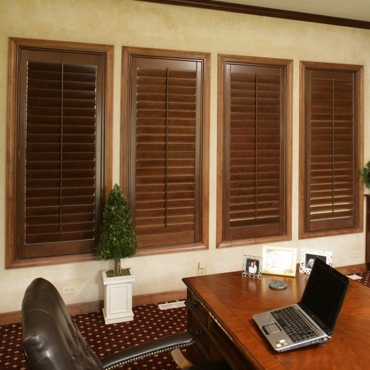 We won’t hide the fact that plantation shutters are the preferred shutters in Oklahoma City. When it comes to shutters that showcase beauty and save energy, louver size matters. Whereas colonial shutters have the smaller louvers, Polywood and Ovation plantation shutters – with their larger louvers and energy efficiency – are your top choice. And don’t forget: larger louvers are easier to clean and adjust. Are the differences in shutters any clearer now? If you have any more questions on finding the best window treatment fit for your Oklahoma City home, call Sunburst Shutters Oklahoma City at 405-300-4664 for a free design consultation today.